In a large pot, combine water, butter, wine, Garli Garni or Lemon Garli Garni, and juice of one lemon. Cover and place over medium heat. 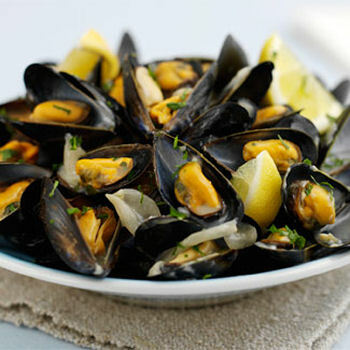 When water begins to steam, add lemon cut in half and squeezed into pot (add the rinds, too), fresh garlic, and mussels. Cover. Cook 5 - 6 minutes or until all mussels have opened. Place in a serving bowl and pour broth over, discarding any unopened shells. Squeeze remaining lemon over top. Serve with sourdough bread to soak up juice.